I was always bothered by slow performance of my lab installation of vSphere Web Client (version 5.5). Although my lab is small I have large number of plugins. I use the Windows installable version which is running together with vCenter, Inventory service, Update Manager and database server. Edit wrapper.conf file which is located in C:\Program Files\VMware\Infrastructure\vSphereWebClient\server\bin\service\conf. in the JVM Memory section. I increased the value to 3072m. Private VLANs (PVLANs) are useful in multitenant environments where there is a need to provide access to single server for all customers while not allowing them to see each other and NAT or dedicated networks are not an option. Agent based backup with central backup server or VM monitoring are example of such use-cases. There might be a constraint that does not allow the usage PVLAN. For example hardware that does not support it (Cisco UCS) or VXLAN logical network. The latter I used in one of my designs. There was a need for single backup network stretched over pods without L2 connectivity. VXLAN can overlay L3 fabric and thus create single network spanning the pods however VXLAN does not support PVLANs. If VMware NSX is used then distributed (in-kernel) firewall can be used instead. If vCloud Network and Security is providing the VXLAN networks then there is App Firewall (vShield App) which unfortunately provides significant performance and throughput hit as it is inspecting every packet/frame in user-space service VM. It also adds complexity to the solution. As of vSphere 5.5 vSphere distributed switch (vDS) supports access control lists (ACL) at the portgroup level. 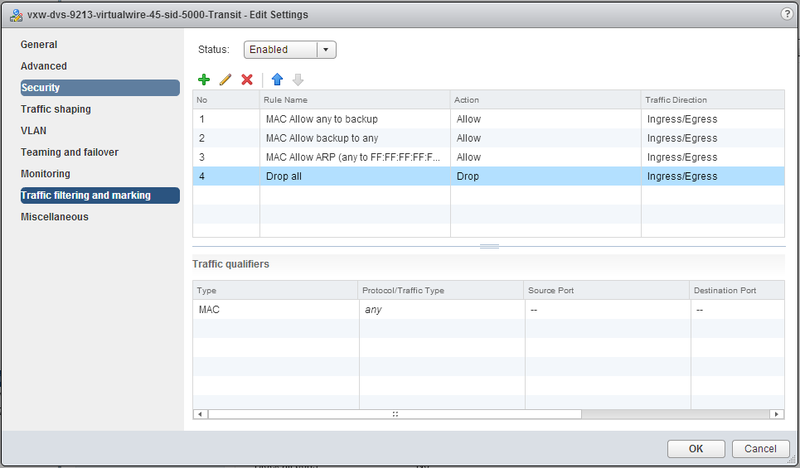 The ACL configuration is available only via the vSphere Web Client in the vDS portgroup > Manage > Settings > Policies > Edit > Traffic filtering and marking section. The following configuration can be used to provide the similar behavior to private VLAN. Note: As with PVLANs there is still a security issue of the tenant misconfiguring VMs IP address and causing Denial-of-Service for another VM with the same IP address. There are ways to remediate it but out of scope of this article. As I started experimenting with VMware Virtual SAN (VSAN) in my lab and am using consumer grade SSDs which are not on VSAN (beta) HCL I am worried about wear and tear of the memory cells who have limited write endurance. I wondered if it is possible to access the SMART attributes of the disks and quick search showed that there is a KB article 2040405 written which still applies although not specific to vSphere 5.5. From the ESXi console run esxcli storage core device list to get list of storage devices and then run esxcli storage core device smart get -d device to get the SMART data. This is output of my Intel 520 drive. vMSC and vSphere HA Timeout? I am currently working of vSphere Metro Cluster Design (vMCS) with NetApp MetroCluster. vMSC is basically a stretched vSphere HA cluster between two sites with some kind of clustered storage solution. The idea is to leverage vSphere HA and vMotion to achieve high SLAs for planned or unplanned downtime. While researching and simulating all the failure scenarios there is one particular that must include manual step. When there is complete site failure the surviving storage controller cannot distinguish between site failure or just a network partition (split brain). NetApp MetroCluster offers Tie-Breaker that needs to be deployed in a third datacenter and acts as a witness to help the surviving controller to decide what to do. 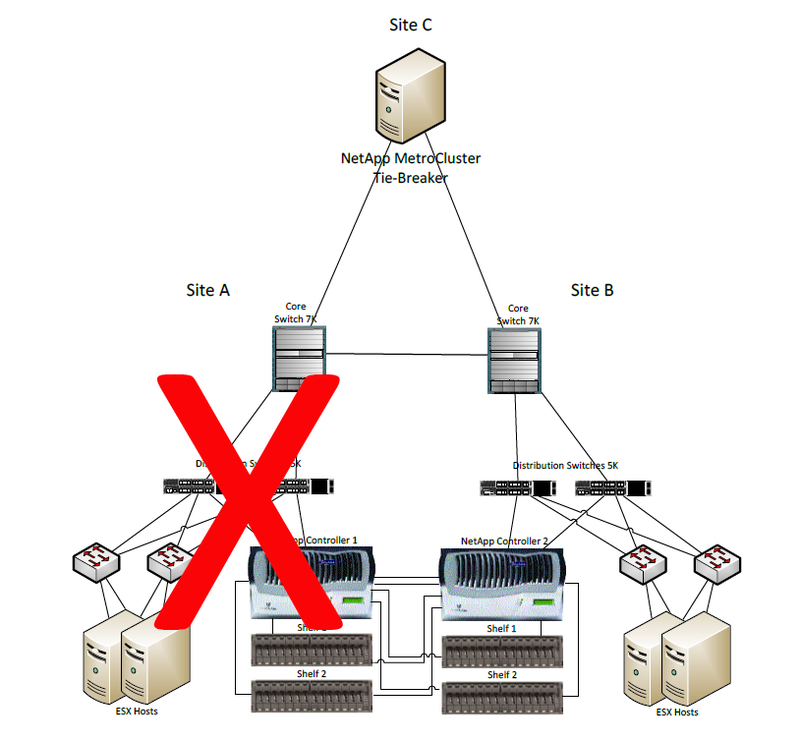 If the third datacenter is not available and Tie-Breaker cannot be implemented the storage controller takes no action and the storage administrator needs to do manual forced takeover of the storage resources on the surviving controller. NOTE: vSphere HA will stop attempting to start a virtual machine after 30 minutes by default. If the storage team has not issued the takeover command within that time frame, the vSphere administrator must manually start virtual machines when the storage is available. I was wondering how to streamline the manual vSphere administrator process of registering and starting the failed virtual machines but to my surprise in my test lab even if the storage failover took more than an hour, vSphere HA happily restarted all the failed VMs. [InventoryManagerImpl::ProcessVmCompatMatrixChange] Updating the existing compatibility matrix. [VmOperationsManager::PerformPlacements] Sending a list of 6 VMs to the placement manager for placement. The host to VM compatibility matrix was updated and immediately the placement manager found suitable hosts and HA restart process started. This means you need not to worry about vSphere HA timeout. The timeout actually does not start ticking till the HA power on operation is attempted and then it takes 5 restart attempts in 0, 2 min, 6 min, 14 min and 30 minute time points. P.S. Lee Dilworth and Duncan Epping actually had VMworld 2012 session about vMSC and this information is mentioned there. P.P.S. Duncan Epping blogged about HA and its dependence on compatibility matrix here. I see more and more customers are migrating from vCloud Director 1.5 to vCloud Director 5.1. One question they have is: “Do we have to migrate to vSphere 5.1 at the same time”? The answer is definite no. 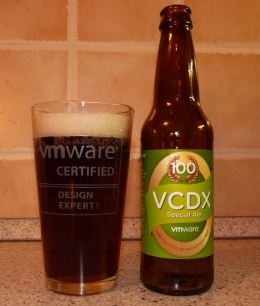 vCloud Director 5.1 supports vCenter 5.0 and ESXi 5.0 and even ESX(i) 4.0U2 if managed by vCenter 5. I always recommend to upgrade vCloud Director in two phases. vCloud Director Cell operating system (RHEL). RHEL 5 is still supported but if customer wants to use RHEL 6 he will need to deploy a new cell as RHEL 5 to RHEL 6 upgrade is not possible. As the phases can be spread out in time this brings the main topic of the article – which new vCloud Director 5.1 features depend on vSphere 5.1 and will not be available during the time between Phase 1 and Phase 2? I have compiled a table which lists the new vCloud Director features and if that feature will be available with vSphere 5.0 (vCenter 5.0 + ESX 5.0. Note: I don’t dare to consider ESX 4). Allocation pool Org VDC type can span multiple clusters. Online migrations and merging of Provider VDCs. ¹) With vSphere 5.0 vCloud Director does not use SDRS recommendation for linked clone placement (Fast Provisioning). vCloud Director picks individual datastore and optionally deploys shadow VM. With vSphere 5.1 vCloud Director fully leverages SDRS recommendations, shadow VMs are deployed by vSphere SDRS. 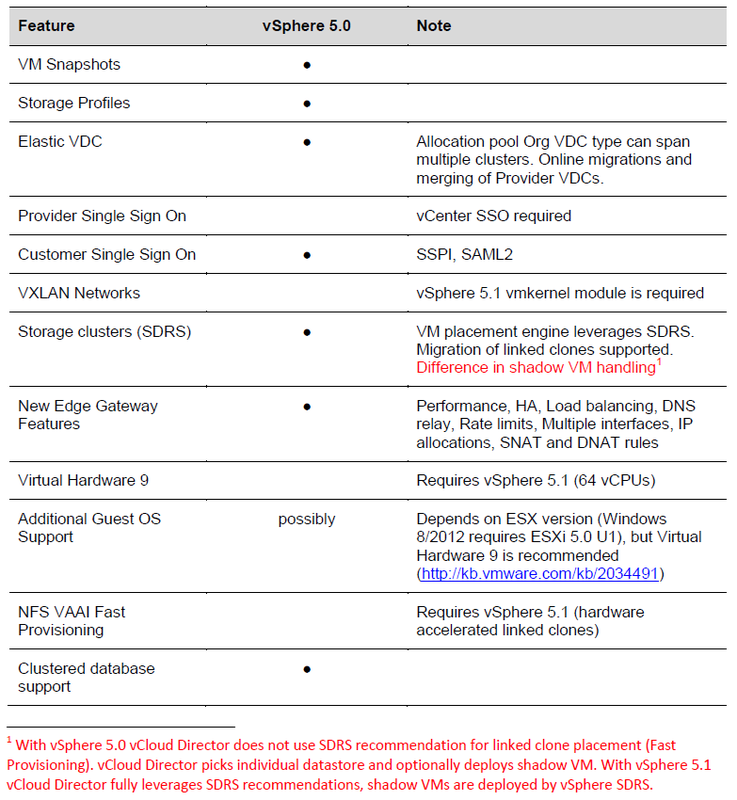 Disclaimer: I don’t claim this table is complete and that it is an official VMware document. If you think something is missing, please comment and I will edit the table. Edit 27 April 2013: Explained difference in linked clone placement.